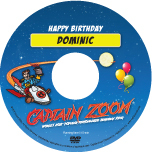 For that special person, the ultimate birthday gift! 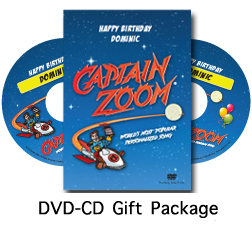 The gift package comes complete with a Captain Zoom CD, a Captain Zoom DVD, a sing-along, a Zoom adventure story and a 4x 6 framed photo of Zoom and his friends in a beautiful gift case. 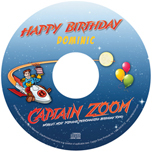 If you are still unable to find the person’s name, click to order a custom name for $15.00 extra. Please use our A-Z Name List as reference or contact us at 1-800-543-9112 for assistance.